Rye’s Winter Carnival Spectacular is on Saturday December 8 from 11am until late, and the weather forecast is mixed, with possibly some showers following on from a very wet day on Friday. 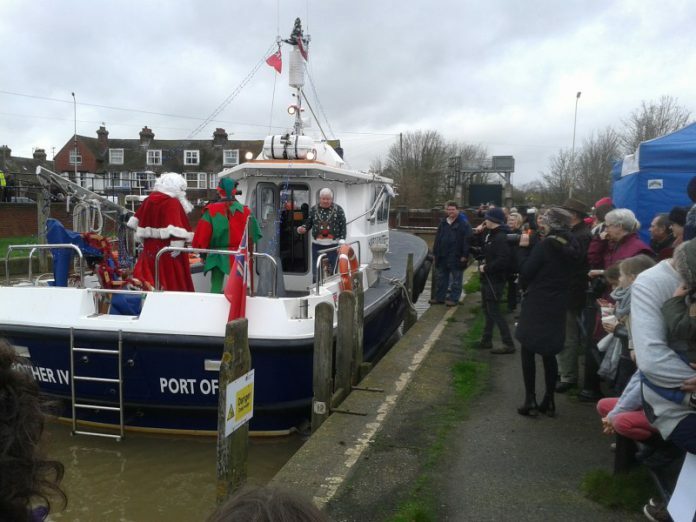 The lights are up along Strand Quay where the day kicks off between 10:30am and 11:30am with Father Christmas’s arrival by boat, tide permitting. Snow may be missing on the streets, but the giant snow globe is expected back in the Cinque Ports Street car park along with small fair rides and food and drink stalls. And the much larger and ever popular Victorian Carousel can be found in the Cattle Market car park. The Christmas Train is also back and you can hop on either at the station or in the High Street. 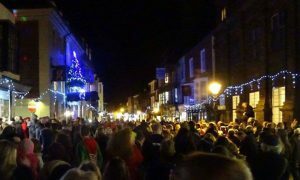 The High Street was packed from side to side last year. Can this be repeated? Busking performances by groups and individuals will be on all day from 11am to 4:30pm at The George in the High Street, at Rye Lodge looking down on The Salts, and in East Street. Reindeer, Santa’s Grotto and an information point can all be found by St Mary’s Centre at the top of Lion Street. And the High Street will host the Xmas races and tug of war between 2:15pm and 3pm and the Christmas procession from 4:30pm , while St Mary’s church hosts the carol concert at 6pm. And hopefully the High Street will again be packed from side to side. Roads will closed at the Landgate and the bottom of Mermaid Street to keep the town centre free for the day’s events.